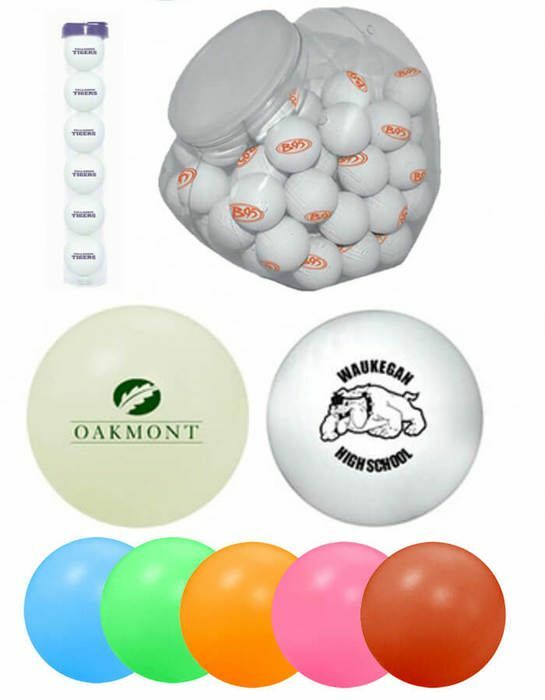 Our promotional air-filled Ping Pong Balls are perfect promotional/display/memorabilia purposes. While they can be used for non regulation table games and carnivals, we still do not recomend playing with them as we cannot guarantee that the custom imprint will stay on especially in wet/damp conditions. Imprint Area 3/4" in diameter. Production Time 5 business days. Rush: 2 business days ($15.00 charge per 500 balls per side applies and virtual proofs are not possible with rushes). Express shipping options available at check out. Virtual proofs will delay orders by 2 work days. Production times are usually firm, but may vary depending on production schedules. Setup Charge $20.00 per imprint/color (2 color max). This was a reorder & the staff was very helpful & professional directing me through the order process. We received them in a timely manner & are a quality product. We are using them for a "Ping Pong Drop" as one of the activities during our Christmas on Market in the downtown business district. Last year marked the first year & it was a huge success by everyone involved. This was a reorder and it arrived quickly and as expected! The staff was so helpful getting the correct logo on the product. Wish the wording was a little bigger, but did the job for our event. The customized ping pong balls were a huge hit this Christmas! Delivery was timely, price was fair, and I will certainly be back.